GOK needs some tender loving care. In October I wrote an email to the ubuntu and gnome accessibility lists suggesting we harmonize our on-screen keyboard efforts. As discussion happens on the OSK-ng wiki, and OSK-ng group, other OSK projects continue and I find myself considering a few options. Join one of the other efforts and make sure the great features in gok are on the road map. Give gok the TLC (refactoring and refreshment) it needs to be more easily used. Continue keeping gok alive, while attempting to harmonize efforts. I want to focus my time and effort to help maximize the advancement of accessibility. IBM and The Free Standards Group (FSG) have announced a new accessibiliy standard API named IAccessible2 (codenamed Missouri). While skimming the now publicly available reference I found some obvious familiarity with existing accessibility APIs: Java (Java Accessibility API), Windows (MSAA), and Linux (ATK, AT-SPI). I'm pleased however, that this does not appear to be a common denominator API but rather has been heavily informed by the richer APIs from Java and Linux/Unix. I'm also particularly interested in finding out how the WAI-ARIA work has informed this standard. There are still some real challenges in the ARIA problem space and having the right accessibility API is a big part of the solution (while writing clever and configurable AT is arguably the other big part). Now, I've gone ahead and erased most of my post after reading Aaron's post (Aaron is from Mozilla), Rich's post (Rich is from IBM), and Peter's post (Peter is from Sun). They have all provided much better information than I would have. Peter's post is extremely interesting for anyone looking for a history of accessibility work over the last ten years or so. I'm probably biased since that is about the amount of time I've been involved in accessibility. Anyways, from a FLOSS AT developer perspective.. I'm pleased to report that the IAccessible2 IDL specification is LGPL licensed. Developers like me can hope to write to one accessibility API (instead of writing wrappers for each platform we target) and more easily port our technology across platforms (assuming we haven't already written our software on portable technology such as Python, Java, or Mozilla/XUL). Time will tell. Today I happily note a small step on my journey into the Mozilla project. 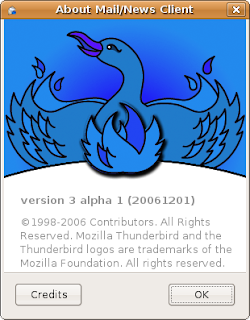 Since I am going to try and pitch in with Thunderbird accessibility stuff I went ahead and pulled the source from cvs, did some magic Mozilla build stuff, installed, and finally ran the latest version from the trunk. I thought my blog needed some colour so I uploaded the "About" box from this version showing an artistic drawing of a blue winged thunder duck-swan thing in repose, perhaps about to ascend? It looks like it could be the parent of the bird shown on the newer logo.